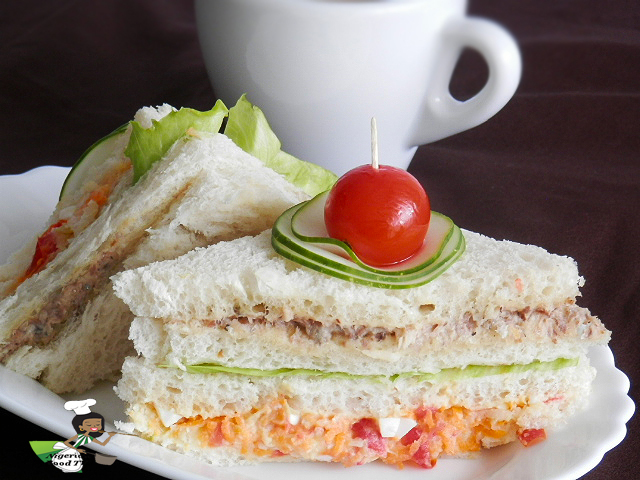 Nigerian Salad Sandwich as the name implies, is a rich club sandwich made up of most of the ingredients you would find in an average Nigerian salad. I usually prepare mine with left over salad ingredients and it’s always a hit at family gatherings. But don’t wait until you have salad leftovers, before you try out this yummy club sandwich. See how to prepare this delicious sandwich below. *If you’ll be making use of salad cream, you can skip the ketchup. *If you don’t like the taste of corned beef , feel free to use soft smoked fish, canned sardines or tuna. 1a. First boil the eggs with a little salt and leave to cool. Then peel off the shells and cut the eggs into tiny bits. If you prefer fried/scrambled eggs, break the eggs into a bowl, add seasoning and salt to taste and fry in a pan with 3 tablespoonful of oil. Mash the eggs slightly and set aside. b. Place the bread slices on a flat board and cut off the crusts(brown ends of the bread) and set aside. c. Now prepare the vegetables by washing them thoroughly in clean water. – Cut the Tomato in half, take out the seeds and chop into tiny bits. – After washing, place the Lettuce in a sieve to strain out excess water. 2. Combine the grated carrots, cucumber, cabbage, tomatoes, eggs and lettuce. Add the salad cream or mayonnaise and mix well until well incorporated and set aside for later use. 3. Place the corned beef /tuna/sardine in a plate, mash well with a fork, add a little salad cream/mayonnaise and ketchup(if using), then combine together until smooth and well incorporated. Tip: Don’t throw away the sardine-oil, you can use it for stir-frys or add it to stews. 4. Now to assemble the sandwich, lay one piece of the bread on your work surface. and place one lettuce leaf on it;place the third bread slice and spread thinly with the corned beef /tuna/sardine mixture and finally top with the fourth bread slice. Repeat with the remaining 4 slices, serve and enjoy with any beverage or drink of choice. Thanks for stopping by. Hope you enjoy the recipe and don’t forget to leave your comment and feedback . I love it nice one. Interesting… I love d recipe. Please can I use sandwich maker after all this process? Yes , you can, but at first the bread will be soggy, as the tomatoes begins to turn to juice and the other veggies will also release some liquid , but after some minutes the liquid will dry out and you’ll have a yummy toast. I'm going to try this out and see how it goes. You're a superstar. Wehdone ma. Hi Nky. I really want to try this sandwich but I was wondering if I can refrigerate it overnight? Because I plan on making it for my son's lunch. Do you think it will get soggy? It looks very appealing to the eyes and am sure it would taste great too. I am a busy bee workdays and most times don't do breakfast. Can i prepare against the next day? Would it still taste great? If no, then what is the duration as time is not on my side week days? You can make the mixture ahead and place in the fridge, but dont place into the bread until ready for use, because the bread might soak up all the moisture from the other ingredients and look too soft. Is it the same as club sandwich? Thanks a million. Trying it nw.